I created donniewilson.com in an effort to take all I’ve learned in my music and mortgage careers and presented it in two locations (day job, night job) in a manner that’s professional yet fun. The birth of my son Jacob in May 09’ and his fight against his congenital heart defect (CHD) changed my life forever. A “Sedated Echo” is the medical exam that most CHD babies require, and that phrase now represents my commitment to CHD support, awareness, and research through the passion of my music. I love to play, I love to entertain, and now I’m ready to ROCK the fight against CHD! Do you know a CHD hero? Last year the Mended Little Hearts #RockYourScar Instagram Photo Contest touched millions as it became the largest CHD awareness program to date. This year we’re looking to make it even bigger so please click the link below for details. Your CHD hero does not need to have a physical scar to enter…we just love the title! We’re all truly scarred from the hard battle with CHD, and this contest shows the world how special these people are! Enjoy! Fall 2014 – Where have we been??? I hope you and your family are well. 2014 became a year that my wife and I really wanted to focus on our own family so we decided to take a summer off from “ROCK The Fight Against CHD.” As many of you know who conduct fundraisers… they literally consume a few months of your life, and we needed those few months for our family this year. This doesn’t mean that we haven’t still supported CHD!! I’ve been working on the National Awareness Committee for Mended Little Hearts, and I’ve also served on the National Steering Committee. Plus, the past two years, my wife and I have been working with the “Chilly B’s” doing the Polar Plunge every January! There are lots of amazing things happening in our community, and we’re excited for the future. We continue to offer support to families facing CHD, and the research dollars continue to flow in an effort to improve the lives of those diagnosed. THANK YOU to all who make a difference out there, take care, and God Bless!! 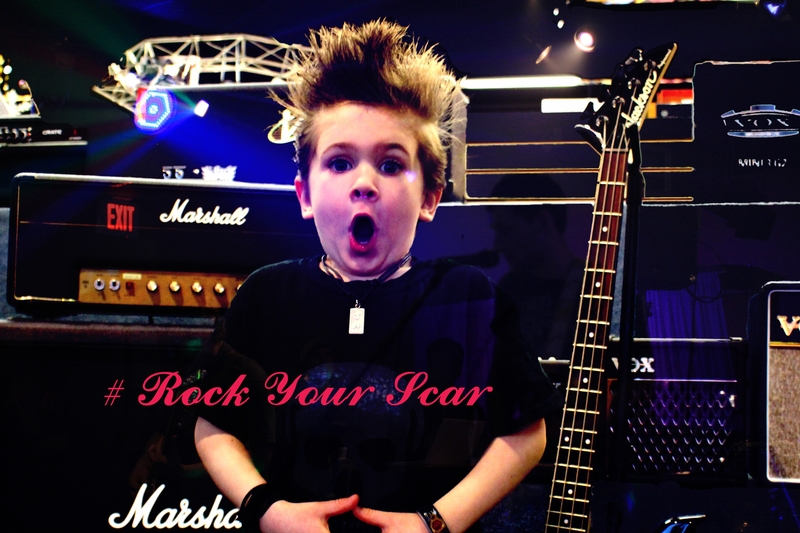 ROCK The Fight Against CHD FOUR! Check out Donnie Wilson and many other dads singing Mariah Carey’s “All I Want for Christmas is You.” Tom Riles (www.lifeodad.com), Trey Flynn, and Trent Hamilton, all CHD dads, appear in the video as well. 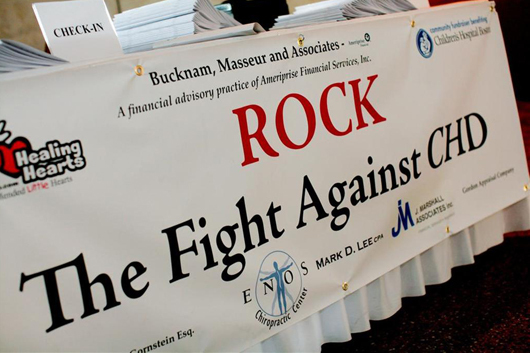 THANK YOU to all who made “ROCK The Fight Against CHD III” raise over $15,000 for CHD research and support! Thank you to Barbara Morse Silva for running this piece on WJAR NBC 10 in support of this year’s concert. In 2010 and 2011, “ROCK The Fight Against CHD” has raised almost $25,000 for CHD awareness and research while drawing over 600 people. On Friday, August 3rd, this exciting concert and fundraising event returns to the Venus DeMilo in Swansea, MA for a third year. 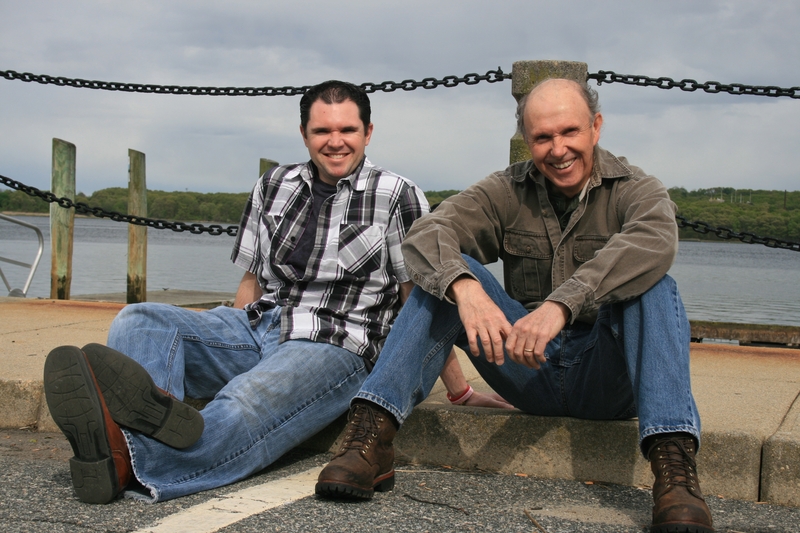 Event coordinator and local musician, Donnie Wilson, is excited to reunite with his uncle, Ed Violette as the acoustic duo, Back-2-Back that had a huge following in the S.E. Mass area throughout the 90’s. Wilson was inspired to write and record his album, Sedated Echo, released in 2010, when his son Jacob was born with CHD (a congenital heart defect) in May 2009. Wilson was always recognized for his soaring vocals, his gritty guitar work, and his charisma in front of a crowd. Now, his return to music is defined by his passion for CHD advocacy. The amazing doctors and nurses at Women and Infants and Boston Children’s Hospital who saved the life of Jacob and so many other CHD patients have served as the inspiration for the single, “Super Hero Fantasy”, which is now being used in several national efforts for CHD awareness. Wilson also serves on the National Awareness Committee for Mended Little Hearts. Ed and Don performed to music fans all over New Englandfor many years. Matthew Bowman from New England Performer Magazine back in the April 1993 issue said, “The vocals and guitar work of Wilson and Violette were all razor sharp, reminding me of the type of stuff Jon Bon Jovi and Richie Sambora do all the time.” If you walked into a local S.E. Mass bar in the 90’s when they were playing, it was full. Now, in 2012, they perform their first full length concert event, with Ed’s son, Matt joining in the second set with the same amazing guitar chops as his dad! 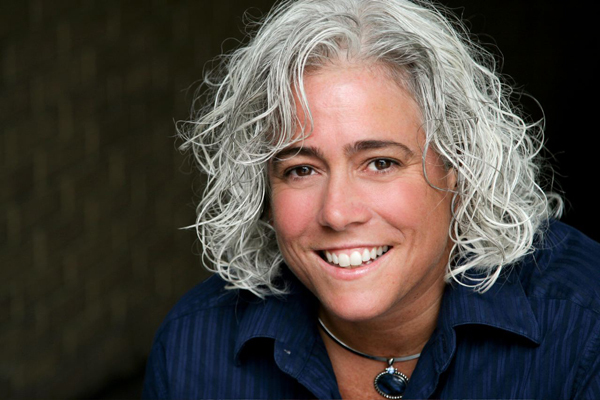 We welcome back our hysterical friend, comedienne and Somerset native, Lizz Furtado, back to host the event. Opening for Ed and Don is 15 year old, singer songwriter, Andrea LeClaire who’s debut video, “Next Time” is approaching 30,000 views on YouTube as of this release. 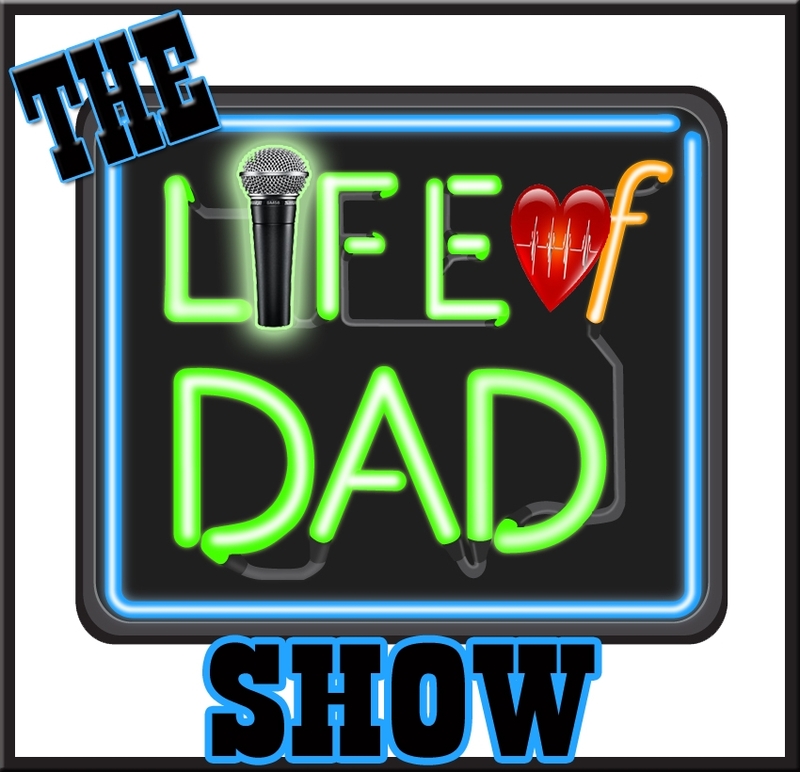 This year’s show will also be streaming live online at www.LIFEofDAD.com, a website launched by comedian and fellow CHD dad, Tom Riles, who currently warms up the studio audience for the Ellen DeGeneres Show. Bring the kids and enjoy some great music, a lot of laughs, our great silent auction, plenty of food, and many special moments with our CHD heroes. Net proceeds from ticket reservations will be donated to Boston Children’s’ Hospital Trust. Net proceeds from the silent auction and corporate donations will be donated to Gabrielle’s Heart Camp for kids with CHD. Lastly, a link will be posted on LifeofDad.com for the people watching live online to donate to the National CHD Awareness Fund for Mended Little Hearts. Tommy Riles doing amazing things for CHD awareness! 5/2/12 Here’s a message from my friend and partner in the effort of creating CHD awareness on a large scale… Mr. Tommy Riles! HI CHD Friends! I Hope that everybody is doing well. Download it to your computer, listen in your care, I hope you enjoy it…I share our entire journey with Barbara, as well as welcome my first guest, fellow CHD dad, and musician, Donnie Wilson (www.sedatedecho.com) Donnie’s song, “Super Hero Fantasy” is the theme song for this new show. Each month, Dr. Wold will answer questions from our listeners about anything CHD. He may also put us in touch with more leading voices in the CHD world, with more specific answers to your questions. Thanks so much for listening to the podcast, and please share this with all of your other heart friends! If you have heart friends that you think may want to be added to the mailing list for this show, please let me know! Also, if you don’t want to be on this list, no worries, just let me know as well. 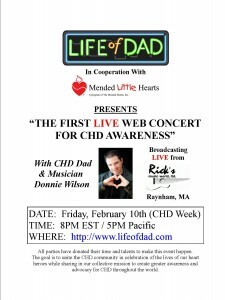 Goto www.lifeofdad.com on Friday, Feb 10th to support CHD awareness! Many in the CHD community know Tommy Riles, a wonderful comedian and entertainer who warms up the studio audience for the Ellen DeGeneres Show out in LA. Tommy and his wife Lucy gave birth to their beautiful daughter, Barbara, who was born with CHD in 2010. Tommy created LIFE OF DAD.COM to celebrate fatherhood with a little humor while also creating awareness for CHD. Around the same time on the east coast, musician Donnie Wilson and his wife Jayna had given birth to their son Jacob, who was also born with CHD. Donnie wrote and recorded “Super Hero Fantasy” a song about the heroes who saved his son’s life lying next to him at Children’s Hospital Boston. That song sparked his new found mission to create CHD awareness using his music. One song turned into the album, Sedated Echo, and now Donnie runs his own yearly concert event along with being on the National Awareness Committee for Mended Little Hearts. 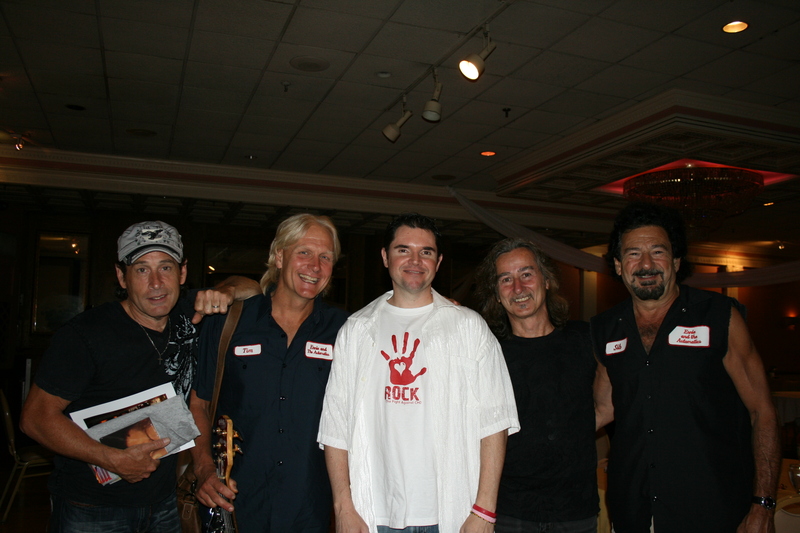 Tommy and Donnie met over the internet as they were sharing similar paths. Tommy was recording “Tiny Heart Super Hero” videos working with Savings Tiny Hearts, and Donnie’s song became the perfect background music since the theme was the same. 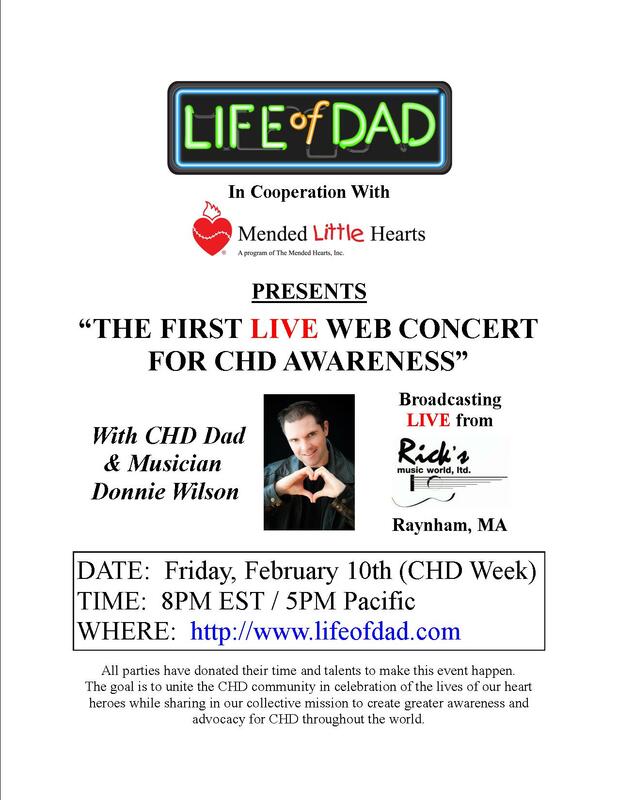 Recently, they came up with the idea to create the first LIVE web concert for CHD as a way to bring the CHD community together during CHD week (Feb 7th – Feb 14th). On Friday, February 10th (8pm EST and 5pm PST), simply go to http://www.lifeofdad.com and watch Donnie perform live from Rick’s Music world in Raynham,MA. Donnie will be performing a short, solo concert while touching on some of his journey with CHD. He is hand picking songs from his own CD, while also performing a few covers that he’s yet to perform live that all have links to our own experiences with CHD. This is a FREE event, and it is NOT a fundraiser! All parties have donated their time and talents to make this event happen. The goal is to unite the CHD community in celebration of the lives of our heart heroes while sharing in our collective mission to create greater awareness and advocacy for CHD throughout the world. Simply go to LIFEOFDAD.com to watch, or come by Rick’s Music World if you live close enough to attend. We look forward to the music, the laughs, and the feeling of unity we will share! We figured that the best w“ROCK The Fight Against CHD II” Breaks The $10,000 Mark Again in 2011ay for us to start out 2012 was by offering a sincere message of THANKS to all the wonderful people who donated their money, their services, their creativity, and their time to our concert last August 11th at the Venus DeMilo in Swansea, MA. Once again, our event was a tremendous success because of people like YOU!! In all seriousness, it took many months organizing an event like “ROCK The Fight Against CHD”, and after the event was over it simply took a very long time to tie up all the loose ends once school was back in session. So, instead of our thank you being lost in the end of year holiday mail, we decided to make it a message to start 2012 with a great sense of accomplishment. There are so many people to thank from the performers, sound engineers, and the folks at the venue to all of the corporate donors, volunteers, and the amazing attendees of the show that we just can’t thank everyone in this short letter. That being said, please know that we thank you from the bottom of our hearts for taking the time to support our mission of CHD awareness and fundraising so that kids like my son Jacob can thrive in the future. We thank Dr. John Mayer for his ground-breaking research as well as Tara Hardimon and her fundraising team at Children’s Hospital Boston for being so easy to work with. I also have to mention that this event could never have taken place without the help and dedication of my wife, Jayna and my mom, Gloria Wilson. Their commitment to this cause is unwavering, and I’m truly grateful for what they were able to accomplish together last year. We look forward to another great event in 2012, and we hope to see you there! Also, please remember to mark your calendars for CHD Awareness Week, February 7th—14th, and check out www.mendedlittlehearts.org for more information. Last year, “ROCK The Fight Against CHD” raised over $10,800 for CHD awareness and research, and on Thursday, August 11th, this exciting concert and fundraising event returns to the Venus DeMilo in Swansea, MA for a second year. Event coordinator and local musician, Donnie Wilson, intends to elevate last year’s show with a bigger headlining act, more outstanding prizes for auction, more free food, and much more. Wilson was inspired to write and record his album, Sedated Echo, released at last year’s show, when his son Jacob was born with CHD (a congenital heart defect) in May 2009. Wilson was always recognized for his soaring vocals, his gritty guitar work, and his charisma in front of a crowd, and now his return to music is driven by his passion for CHD advocacy. The amazing doctors and nurses at Women and Infants and Boston Children’s Hospitals who saved the life of Jacob served as the inspiration for the single, “Super Hero Fantasy”, which is now being used in two national campaigns for CHD. Along with Donnie Wilson and his band, Matt Borrello and the Quality Dogs will be back by popular demand performing in support of their new CD, “Don’t Turn Around.” Donnie’s cousin, singer Kristine Rommel, will be performing songs from her CD, “Choose To Fly”, and hysterical NYC- based (native of Somerset, MA), comedienne Lizz Furtado will be hosting the entire show. We’re also thrilled to welcome back Michaela Gagne, Miss Massachusetts 2006 and CHD survivor, who speaks internationally on the subject of heart health for children. All proceeds will be donated through “Jacob’s Fund” to the Boston Children’s Hospital Trust for CHD research. Reservations – $20 for adults ($25 at the door) and $10 for 18 and under. “Super Hero Fantasy” – (The song for CHD) – NOW AVAILABLE AS A FREE DOWNLOAD! : : FREE DOWNLOAD : :to all who want it. This is a re-mix of the song that I hope you’ll enjoy and share with anyone you feel could use some inspiration. All that I ask in return is to please share the link to my website so that people can read our story. On September 11, the American Heart Association – in partnership with Swarovski – coordinated the first annual Little Heart Hero Day at Roger Williams Park Carousel. The program focuses on children with congenital heart defects (CHD), their families, pediatricians, hospitals and support groups in an effort to offer education and resources for a population that is often unrecognized.On this day, children with CHD, their parents, grandparents, siblings and other adults living with CHD were given the opportunity to share experiences, network, find support, gain valuable information and, at least for one day, forget about hospital trips, surgeries and medical expenses and just have fun. Thank you to all of my valued corporate sponsors, who are also my friends, who wrote checks to cover the expenses for the event. Thank you to all who took the time to solicit and/or donate to our silent auction which people are still raving about. To all of the performers, you really made this event a hit because I am STILL getting comments on the quality of the entertainment. I think many people who were planning on popping in for an hour ended up staying the entire evening. To the sound (Rob Lima, Rick’s Music World), lighting, and video professionals (Russ and Video Excellence) it was great knowing we had top notch people making everything look and sound great. To the ladies who ran the show that night, Gloria Wilson (mom), Karen Benz, and Kelly Weglowski (there would not have been a silent auction without your guidance! ), you made the difficult seem easy as the evening went as smooth as could be. Thanks to my friend Ginny Shea of Mixed Media and Barbara Morse Silva for running the piece on WJAR 10, as well as Paul and Al from WHJY, George Mason from the Spectator, and Hector Gauthier from WSAR. Thanks to Miss Massachusetts 2006, Michaela Gagne for being a wonderful hostess and for bringing Miss Massachusetts 2010, Loren Rabinowitz, along with you. Thank you to Monte Ferris at the Venus DeMilo, Copy Inks, Alex Agronick, and Heidi Caron-Guay (Dragonfly Interiors) for helping with the decorations. Thank you to my dad for being the accountant when the show was over! Thanks to my wife Jayna (and my three kiddies) for her help with our auction as well as for her support with the planning of this event and the recording of my album. To the rest of the volunteers who gave of their time and resources to be a part of this special evening: from the bottom of my heart, THANK YOU! This is not only my first attempt at organizing a large fundraising event in the fight against CHD, it also represents the release of my first CD project since 1997. I will be performing music from my new CD with my band, Sedated Echo, along with four other fantastic local artists: Mia Boostrom (Top 20 Finalist from NBC’s America’s Got Talent), Matt Borrelloand the Quality Dogs, Blue Light District (with CHD survivor, John D’Amato), and 13 year old pianist and singer, Andrea LeClerc. The evening will be hosted by Miss Massachusetts 2006, Michaela Gagne, who speaks internationally regarding her experience as a CHD survivor. There will be a huge silent auction, free appetizers, a cash bar, and a ton of fun for the entire family. Come out and support an important cause while listening to some great music. All reservation proceeds will be benefit “Helping Hands, Healing Hearts of RI” (A Chapter of Mended Little Hearts), and all corporate donations, along with silent auction proceeds, will be donated to Children’s Hospital Boston through “Jacob’s Fund” for CHD research. Reservations for adults are only $20 ($25 at the door) and $10 (18 and under). SOMERSET, MA — About 15 years ago, Donnie Wilson was trying to make it in the music business. He hoped to get a contract witha record company. He had an album, played on stage with Jimmy Buffet at the Comcastcenter. He was in Jesus Christ Superstar. He was packing the old Somerset Lodge with his uncle, Ed Violette, and their duo, Back to Back. He was close. Wilson never became a rock star, but many years later he is back to his music and he has a different focus this time. What has inspired Wilson’s music today is his 10-month old son, Jacob, who was born with a heart defect. During the trying time with their son, Wilson and his wife, Jayna, found healthcareworkers from three different hospitals and their family and friends around them to be so supportive. It was so inspirational, that Wilson decided to try to describe it in his lyrics for a recording. The name of the song is called “Super Hero Fantasy” and Wilson will be playing the rock and roll ballad at Cupper’s Cafe in Somerset on March 19. Wilson will be playing a full scale concert for the first time in about 10 years at Cupper’s Cafe, located on County Street in Somerset, on March 19, from 7 p.m. to 9 p.m.
Wilson said the heroes to his family were not just the doctors and nurses, but also friends, who did things, like take care of their children when they had to go to the hospital or who made them meals during the months they were going to the hospital. “Heroes come in many different forms,” Wilson said. All of the proceeds from the sale of the single will go to Boston Children’s Hospital to help youths with congenital heart defects. Wilson and his wife have raised $2,000 for the hospital so far. People can donate to Jacob’s Fund to help him and others like him who have heart defects. To donate to the fund, people can go to donniewilson.com/nite and click on Jacob’s Fund where they can hear the song and read about his story. Wilson will have copies of the CD at Cupper’s. “It is a very good example of how very wonderful things can come from very difficult experiences,” Wilson said of the song. Wilson is on the board of directors for Helping Hands, Healing Hearts, which is part of the Mended Little Hearts organization, which provides resources and a support network for parents with children with heart defects and heart disease, which has asked his permission to use his song on its website. Wilson said his son’s heart defect cannot be fixed with one surgery. He said it will be a lifelong concern for Jacob. “My son is doing very well,” Wilson said. Wilson was married 10 years ago. He and his wife have three children. The logo for the single was designed by Wilson’s two daughters, Delaney, 7, and Jocelyn, 5. The logo has a heart with a music note for a face. Wilson, a 1988 graduate of Somerset High School, earned his master of business administration degree and went to work in the mortgage industry. He paid for his MBA by playing out at night while he was taking classes during the day. But a couple of years ago, he got the urge to go back to his music. He had been singing the “ABCs” and the Wiggles songs for his children, but he wanted to go back to his days of classic rock. His goal was to start a website, showing what he did in music many years ago, and then make an album that would coincide with his 40th birthday. In the middle of writing his album, Wilson’s wife was seven months pregnant and started bleeding. They found out that the son they would be having was OK, but he had a heart defect. The diagnosis was done in Women and Infants Hospital in Providence, Jacob was born in Brigham and Women’s Hospital and was taken to Boston Children’s Hospital for surgery. Wilson has been reconnecting with old friends from Somerset High School and people he knew when he was playing music many years ago through Facebook. Wilson grew up liking bands like Boston and the Christian rock group Stryper, but he said Violette was his biggest musical influence. He actually auditioned for the open vocalist job of Beatlejuice, the Beatles tribute band that former Boston lead singer Brad Delp fronted before passing away a few years ago. Wilson recorded his new album with Russian Alex Krepkikh. Wilson recorded all of the vocals and played guitars for the album. Krepkikh played guitars. Roland Audette is the drummer. While he has copies of the single Super Hero Fantasy already made, the full-length album will be done later in the summer. With job and family obligations, Wilson said he does not have as much time to devote to his music as he used to, having to find pockets of time here and there to work on it. Wilson said Jacob may or may not be in attendance when he play’s at Cupper’s on March 19. While Wilson never became a rock star, he now feels that is not what was meant to be for him. But he says what was meant to be was for him to use his music to help children with congenital health defects. “Super Hero Fantasy,” a catchy rock ballad, written by singer/songwriter, Donnie Wilson, was inspired by the birth of his son Jacob in May of 2009. Like 1 out of every 100 children, Jacob was born with a congenital heart defect (CHD). Dealing with heart disease, especially when it comes to children, can be extremely difficult and in many ways life changing. “We want listeners to know that there are heroes at places like Children’s Hospital Boston that perform miracles on a daily basis,” says Wilson. 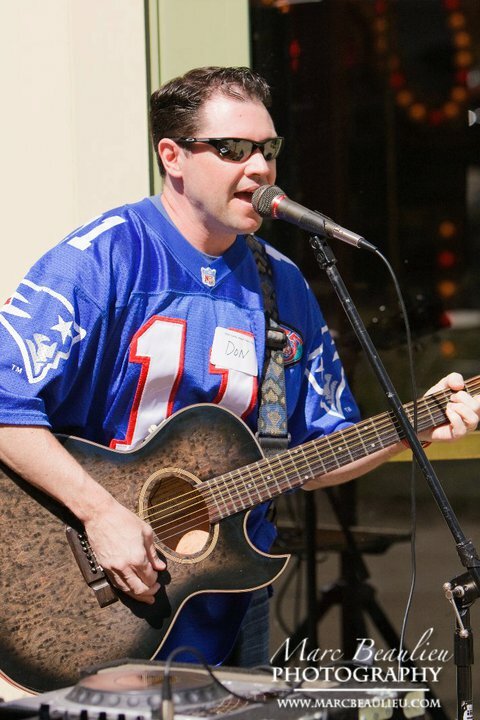 Donnie Wilson was a full time musician in the 90’s, playing acoustic guitar and singing at clubs and colleges throughout New England. In 1997, not long after the release of his first CD titled, “Lather, Rinse, Repeat” with his band Deep Sneakers, Donnie left music to pursue a career in the mortgage industry. In 2009 Donnie was in the midst of launching www.donniewilson.comwith the goal of recording a new album and getting back into music before turning 40 in March of 2010. “Right in the middle of writing this new music, along came the news about our son. My wife Jayna and I were devastated! As I sat in the little bed next to him in the Cardiac ICU it occurred to me that these amazing doctors and nurses were literally saving my child’s life right before my eyes!” This notion evolved into the song, “Super Hero Fantasy”, a message of hope which hi-lights how we all have the ability to be the hero that saves the day, even among the most dire of circumstances. Profits from donations to Jacob’s Fund will go directly to CHD research at Children’s Hospital Boston. Everyone kind enough to make a donation will receive the MP3 of “Super Hero Fantasy”, which is becoming the anthem for CHD awareness, support, and research. 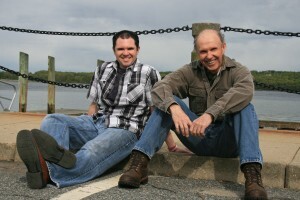 CD singles are in production and should be available by spring 2010. “I’m humbled by the gift my son gave me in this song, as I feel it’s the best I’ve ever written. I’m hopeful that it makes a difference.” Wilson intends on performing in 2010 to support this song as well as the release of his full length album titled, “Grateful”, which is pegged for summer release. Wilson now serves on the board of Helping Hands, Healing Hearts, a RI based organization created to support families with children inflicted with CHD. “Super Hero Fantasy”, the song my son inspired that we hope will create a lot of funding for CHD research has been delayed one more month with a new release date of February 1st. The original recording plan fell through as well as the first version of the song being scrapped. It’s hard enough just to find recording time, and when things were not working it was hard to accept. But, I’m a believer in “The Secret” and I know all of my misfortune getting this song recorded this fall occurred so I could meet Alex Krepkikh, owner of Alex’s Wonderland Studio (www.alexkstudio.com). When things were going wrong I called my good friend Todd Keating, bassist extraordinaire, for advice, and he directed me to this guy (I owe you one Todd!). 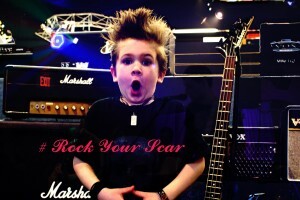 Alex is a tremendous local talent of Russian descent, who is an amazing engineer, producer, guitar player, etc. who is also simply a wonderful person. I’ve recorded a few projects in my past music career, and nobody has extracted music out of me like Alex. “Super Hero Fantasy” is coming out so good, that today, after I recorded the lead vocals, I literally cried when I listened to it. For those awaiting this release that have ties to CHD and this noble cause, I think you’ll be thrilled with the final product. I’ve already asked to record the rest of my album with Alex, and now it’s just a matter of making the time. It’s a challenge with a full time job I enjoy and three active children, but I’ll make it happen! I’m also excited to perform a bit this year. Community Auditions was a nice start, but I must say it was a bummer to miss out on performing in the finals. I was ready to hammer out Boston’s “More Than A Feeling”, and believe it or not, Boston’s drummer from the 70’s, Sib Hashian, was a judge. But, it was just not my time. My time will come, and I’m hoping to see many of you along the way. I’m hoping to play a small show over at Cupper’s in Somerset, and I’m performing at a CHD fundraising concert in April. p.s. – Jacob had his first appointment with his cardiologist since September, and it went VERY WELL! Next one not until his first birthday in May. Jayna and I are truly blessed as Jacob has been doing very well. The last procedure on Jake’s heart was a planned balloon dilation of his aortic valve back on September 30th. The doctors wanted to do that to relieve some of the pressure that has been building up across that valve due to his critical aortic stenosis. So, how did it go you ask? It didn’t. When they went in with the catheter and measured the pressure gradient (it’s much more accurate than echocardiogram) they found that the pressure was in fact not bad. We’ve been looking at numbers over 80 and they found it to be around 50. This is still high, but for a baby Jake’s age, they determined to hold off on the dilation. This is mostly due to two reasons: 1. He is NOT in danger by leaving the valve like this and his heart, specifically his left ventricle, is performing well, 2. Due to the fact that he’s been doing so well eating, growing, and developing, there’s no indication clinically that his heart is not supporting his body. If he were 12 years old and wanting to play sports… we would have had a different decision. For now, they will watch him closely and probably schedule another catheterization to check the valve when he is one year of age. So, is this good news?? YES! His next appointment is not until January 2010. Our doctor shared that if we were to take Jacob to 100 hospitals that do infant heart care, probably 95% would have just dilated the valve or replaced it. Once you cause regurgitation by over-dilating, or if you decide to replace the valveyou open up many doors that are ugly to walk through. The research through Boston (the best of the best) shows it’s better to wait it out and let the child develop while the heart can support the body’s activity well. We agree with their decision. We may need more dilations or even a replacement down the road, but if he’s much older, he will handle it much better! Also, “Jacob’s Fund” is officially up and running. The song “Super Hero Fantasy” is currently in production and it sounds great! I performed the song for the 1sttime in public recently at my friend, Julie Ostiguy’s home and it was a huge success. Please click on the link for Olivia’s Fund to learn more about her little angel. This weekend is CHD Day in Wayland, MA, and I’ve been asked to perform the song before each keynote speaker. What an amazing journey! Thanks AGAIN for the prayers, and take care!